On spa days and vacations, we are constantly being told that we can’t take something when we go. But what if we could? We can’t help but brainstorm ways to have our “vacation mode” mindsets actually continue long after our trip ends. What if it was possible to be wrapped up — any day, time or place — and suddenly be brought back to a more relaxing moment? Let us be clear, we are by no means recommending or suggesting another bikini photo for #TBT. We are talking about something that will last longer than all those Instagram likes. We mean those plush hotel linens: robes, slippers, towels and the works. Parachute is the one-stop shop that provides a little piece of paradise without the travel. With a wide variety of cashmere blends, plush robes and fluffy socks, we too have started to ponder: how luxurious is too luxurious? Simple. The limit does not exist. So much so, that we’ve rounded up the six must-have products that will keep you wondering: what was life like before this? Step right up, with these slippers, heaven is only a click away. Parachute’s Quilted Slippers are ideal for shoppers looking to add an added spring to their step. No, this isn’t a dream, but we’re certain it’ll feel like it. The quilted slippers have a plush interior that literally will feel like a pillow party for feet. The off-white/slight grey-hue is chic and aesthetically appealing. The terry cloth is light enough to keep feet feeling cool but transitional enough to ensure feet stay warm when necessary. Above all, the ribbed soles add an extra layer of protection making these slipper suitable for any environment! 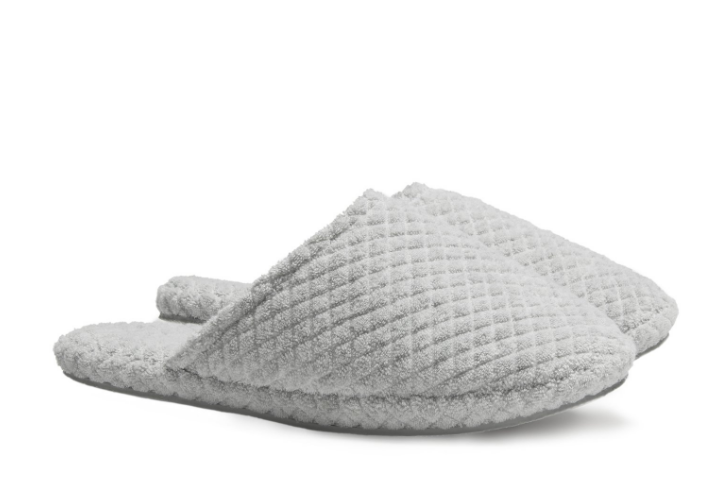 See It: Grab a pair of Quilted Slippers for $39 available on Parachute! Who says we have to go to the spa to be at the spa? With this Classic bathrobe, Parachute has made it possible to keep our mind’s at ease, without ever having to leave our beds. The classic bathrobe has two slouchy pockets in the front, a snug tie waist and a cozy shawl collar. Constructed of 100% long-staple Turkish cotton, we can’t help but go crazy for this robe. Reviewers who’ve purchased the classic bathrobe can’t express enough just how much they — and their significant others — love this robe! Due to its soft material and luxurious feel, reviewers are claiming it makes the best gift for any loved one! And how can we disagree? The robe which comes in three colors: white, stone (a dark grey-hue) and mineral (an off-white mixed with grey shade) are by far the most versatile pieces we’ve seen in a while! We can’t put a price on life, but if we could we’d say that it’s only one tie away! See it: Grab the Classic bathrobe for $99 at Parachute! The Cashmere Blend Robe is ideal for the shopper who enjoys the finer things in life. While we often wish we were waking up in an all-inclusive, 5-star resort week after week, the chances of that happening are slim to none. Instead, opt to slip into this Cashmere Blend Robe. The 90% wool and 10% cashmere sweater not only looks but feels luxe. We can’t help but actually be excited for chilly mornings when grabbing a coffee just so we can wear this. See it: Grab the Cashmere Blend Robe for $249 at Parachute! While that tropical paradise may not be on the horizon, chances are a short overnight trip is more than likely going to come up from time to time. The Merino Travel Kit will instantly transform any and all travel to first class! Be anything but basic with this matching grey and white design. 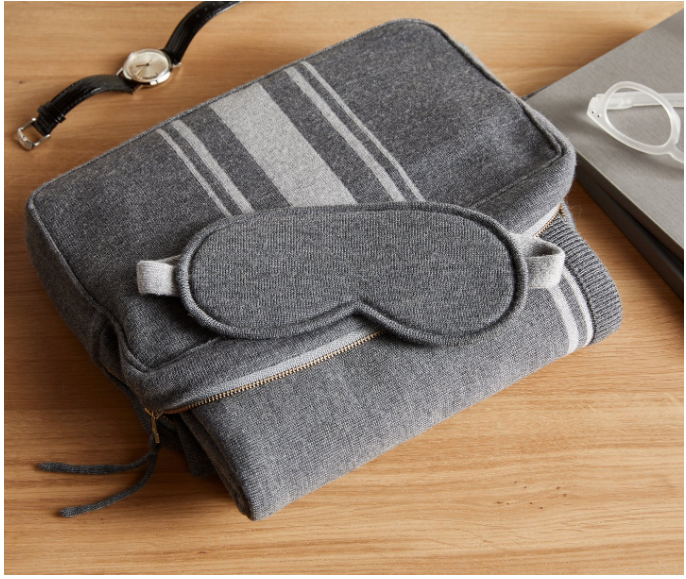 The travel kit is made from 100% Merino fine wool and covers all the bases, including all the basics such as an eye mask, carrying case and blanket. Fresh towels are life’s guilty pleasure. Don’t you agree? The Classic Towels are the simplest solution when trying to live the suite life, daily. 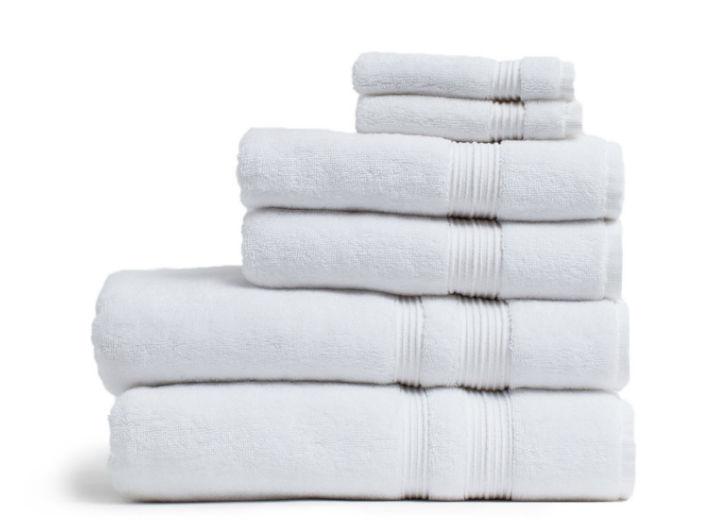 Whether the search is for a washcloth, towel set, hand towel, bath towel or bath sheet, this classic signature staple will cover all the basics. Even better? The wide range of colors. Available in: white, buff (a beige-hue), mineral (a crisp off-white), stone (a medium grey-hue) or shore (a light blue), we can’t help but swoon over the neverending tones. See it: Grab the Classic Towels starting at $9 on Parachute!